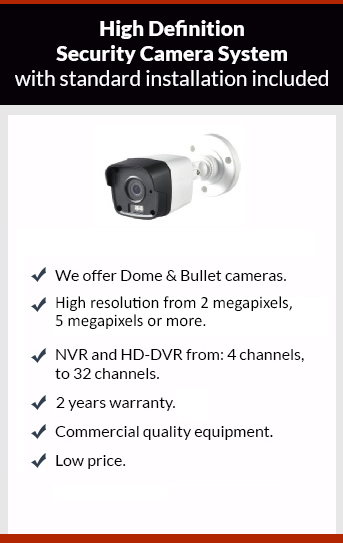 Get affordable Security Camera installation on Bell Flower, CA and CCTV equipment with commercial quality and 2 years warranty. If you want to watch inside of your home, there is a special small security camera that is called “pinhole camera”. This camera has a little hole where the camera gest the picture; this camera is really small and most of them has a 2.8 mm lens (wide). This camera is installed in hidden cameras like: smoke detector camera, alarm sensor movement camera, radios, toys, etc. If you need to see outside of your home the camera will be different like: infrared weather proof camera. Protection4Less install 2 types of technologies: TVI and IP. Our DVR ‘S can manage old analog systems, but also the new High definition TVI technology. TVI system can use the wire already installed in s facility, making easy the upgrade to high definition security cameras. The TVI – DVR can be connected to old analog camera and also to TVI analog high definition camera. IP security camera system is used when higher resolution than 1080p is required. Protection4Less can give you the best solution for your CCTV needs. Please give us a call, the estimate is free.